On the 12th November 2011 we welcomed Bishop David Walker, bishop of Broken Bay, and Abbot Michael Kelly, our Abbot General in Rome, to mark the fiftieth anniversary of the laiyng of the foundation stone for monastery with the blessing of the altar of the refurbished Chapel. We were joined by a large group of family and friends, many of whom found the changes more open and embracing of the worshipping community. The new floor has enhanced the acoustics with both the spoken word and that sung being now clearer and crisper. Besides replacing the carpet after more than thirty years of wear and tear, we put double glazing into teh existing window frames, hoping to make the chapel more energy efficient and comfortable in winter. The central columns have been moved to the sides. 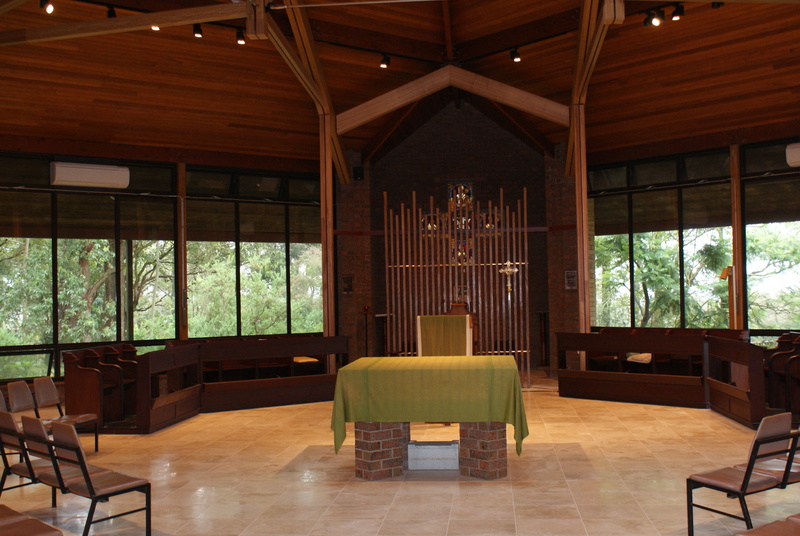 The timber which clad the columns previously has been recycled into a screen behind the presider’s chair which now marks out the Blessed Sacrament Chapel. The slats of the screen are turned sideways allowing sight of the Tabernacle while separating the liturgical from the devotional space. The wooden choir stalls have been used again. The northern brick wall is now hung with 16 depictions of the Kerygma of Christ – the work of Mr Terry O’Donnell. Two details taken from these: the heads of the angel and the Blessed Virgin may be seen below, with the faces of Saints Henry the Confessor and St Gertrude from the Dunbar Windows found in the side chapel to the left of the altar. And a third, a model church which St Henry holds in his left hand may be seen at the left.